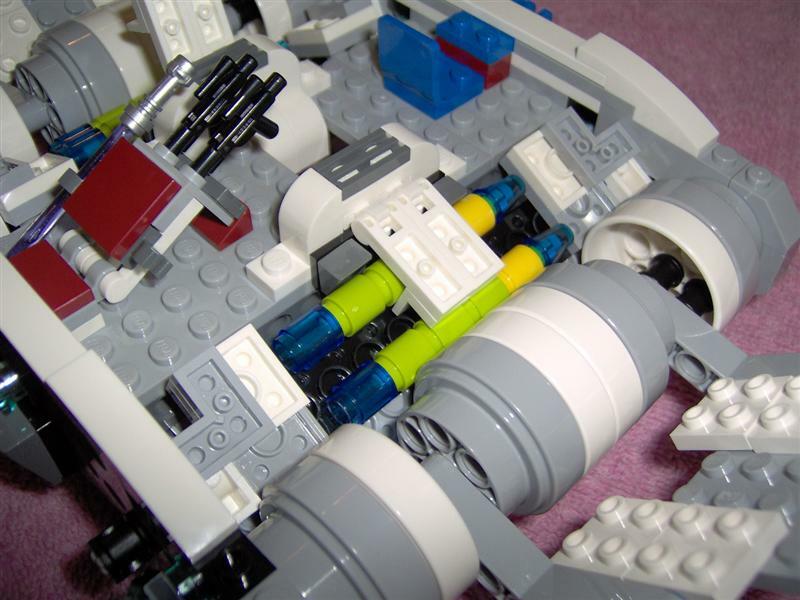 Ok,I've found more pictures of the republic shuttle , it looks great but it has a very ugly interior! a lot of space is taken away by the weapons sistems ,there is only one chair and there isn't any boarding ramp! so...do you agree with me? it needs a lot of mods! Personally, I think the whole ship looks junk, even more so than the Twilight. This is one I don't want to buy, except for Mace Windu. I was thinking about getting, looks like interior could be modified to have more room. Mybe move the plates below bricks with technic holes and maybe even add a ramp or door depending on how far you lower the floor. I do not think it is possible to be more junky than the Twilight - the Twilight is the first set in quite a while that I did not even consider buying, and I am something of a completist. Wow, bad interior indeed! Well I'm not supprised, LEGO doesn't seem to focus on making accurate interiors to their sets especially when its not to scale. Yeah, that is not a good interior. However, I do want this set, not only for Mace, but because the exterior looks nice. You have to love the clip holding on to the lightsaber blade. That made me chuckle. I fell out of love with system sets long ago, and only buy them for parts these days. They still think about you sometimes...especially when they go to the Olive Garden. I agree. It's not a great interior, but the set does have some cool features, and overall, I really like the set and plan on getting one as soon as I can find one. ***Were these pictures from the Eurobricks review? I'm not suprised the interior is junk. Lego has never really been big on making amazing interior's to ships. And as for the ship, I can't say I'm a fan of it. Mostly the colour scheme is the turn off for me. I'm hesitant to say it's worth $60 (or less, if that's TRU's jacked-up price) but it's not that bad in person� those first couple close-up pictures in the OP emphasize the color smattering when it doesn't really look that bad when you see the ship as a whole. I'll be the first to admit that the set looks like someone's fairly average MOC, but I have to admit that the thing has a really nice profile and shape (except for the head*) when the wings are down, and it's imposing enough in its landing mode. The top "fin" part would do well with some more texture in the flat vertical planes, for example. The missile rack up top, although an eyesore, works surprisingly well. The dropping rainbow-pop bombs work really well, too, and for some reason I really like the odd color scheme they have. *The head is just goofy. It's got the same lame "one clip" connection to the rest of the body that the ILC had, so there's a gaping hole between the head and the body. The straight front edge of the nose just looks odd, like there should be angled SNOTed wedge plates there instead to taper it off. It's constructed nicely, but does not blend or flow with the rest of the ship. Having read the reviews I am happy with the interior on the basis that the mechanism for the bombs is actually pretty cool. It is, afterall, aimed at kids and bombs that work is far more appealing to them than a few chairs and computer screens. Mind you, anyone expecting this to have an interior of any great detail was surely living in dreamland?! I do agree that the front end looks a little boxy, but I guess that's the design of the ship. Perhaps it just doesn't come across well in Lego form. This is one set I will be picking up on sale, not at RRP. Having seen the set reviewed I am no longer keen on getting this set... at least at current RRP. The external colour scheme does not look good. Overall it is smaller than I had imagined. I had hoped that the cockpit interior would drop allowing the pilots to exit through the nose ramp as per the movie. A lack of any real interior just underlines the deficiencies of the set. I have a few original Mace Windus sono immediate concern to collect that figure. In contrast to the views of others I actually think the Twilight is a good solid set made even better with a little customisation. The interior is one aspect I don't much pay much attention to unless it is visible when displayed. Example: Snowspeeder, V-19 etc. Also, the AT-AP was not the best design only because you could see inside the vehicle from certain angles. Which was lame. How it looks inside is not a big factor for yours truly. A non-CW Mace Windu head would have been nice. (Christmas is the time for miracles). Otherwise, the ship looks pretty sweet. I mainly got this set for Mace (I only have the LUL Mace), and I thought the design was neat looking. Actually, this set is priced right about where it should be for $60. It has 636 Pieces, and anytime I can get a set for less than 10 cents a piece, I won't complain. The interior is nowhere near as bad as the Twilight, and the kids will love the dropping bombs and rapid-fire missiles. This set will be great once I up-scale it. It needs a lot of work. The nose should open so Ashoka can walk down the ramp from the hold. I picked up the Twilight on clearance...and plan to upscale it some as well. 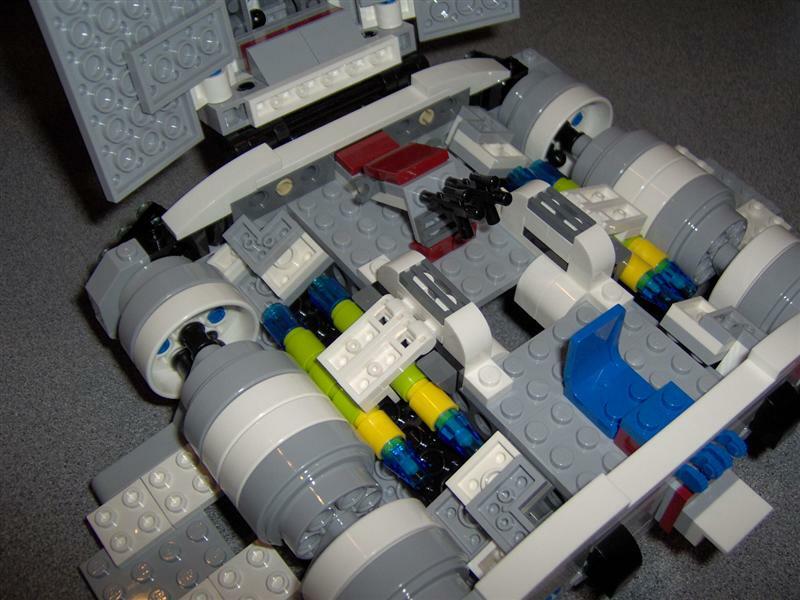 Anakin's starfighter should be able to fit in the back of the Twilight. Have fun with the upgrade. It sounds like a job and a half given the scale of the shuttle. It would be cool if you could post pictures of your finished set and with Ahsoka on the ramp. I thought too about expanding the Twilight to accommodate Anakin's starfighter but I do not believe it to be practical without creating an entirely new UCS scale Torrent which would also give it the decent sized bridge that it deserves. You guys say there is no boarding ramp, but there is a massive hole in the bottom of the ship to make quick escapes! Of course...I have to find Anakin's starfighter now. I finally got some cred and christmas cash after the holidays....and all the sets I wanted are gone. The shelves are clean. No Republic Gunship or Anakin starfighter anywhere to be found.